WinZip - Knowledgebase / WinZip / Zipping and Unzipping / How do I control the folder information WinZip stores in a Zip file? If you are using WinZip 18.5 or earlier, you should see this archived article about the same subject. When you zip the contents of a folder, there are three ways in which you are likely to want folder information stored. Please refer to the picture of an open folder window above to understand the example pictures that follow. 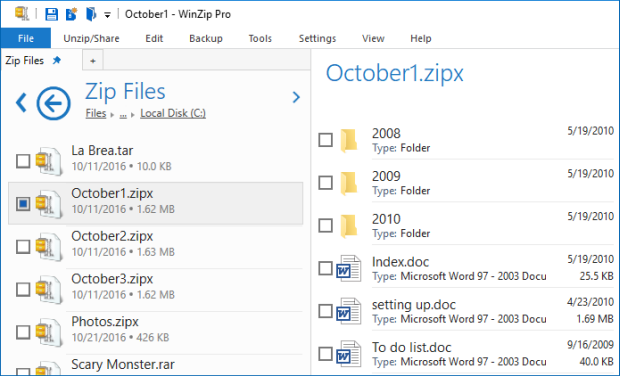 In each picture of the WinZip window, a Zip file has been created containing the files in the 10October folder. You can then refer to the instructions that follow to create your own Zip file with similar folder information. How do I store folder information only for subfolders? 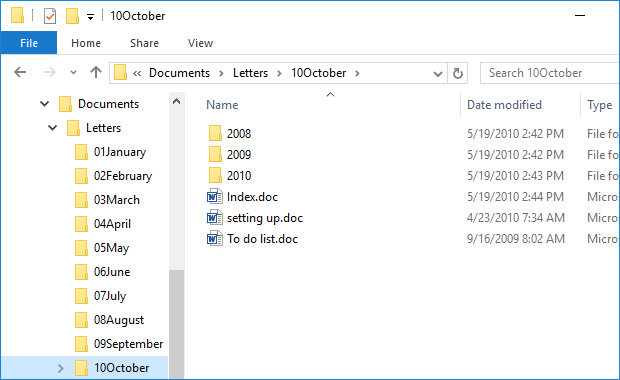 How do I store complete folder information? Note: You can use WinZip Express for Explorer to achieve the same results as those above. Just click Zip and Share (WinZip Express) when you right click and the WinZip Express dialog will open. This will also provide additional features, such as sharing your file as a link. How do I compress a folder and later restore it?